Mount Agung or Gunung Agung is a volcano in Bali, Indonesia, southeast of Mt Batur volcano, also in Bali. Gunung Agung stratovolcano is the highest point on Bali. It dominates the surrounding area, influencing the climate, especially rainfall patterns. From a distance, the mountain appears to be perfectly conical. From the peak of the mountain, it is possible to see the peak of Mt Rinjani on the nearby island of Lombok, to the east, although both mountains are frequently covered in clouds. Balinese believe that Mt Agung is a replica of Mt Meru, the central axis of the universe. The most important temple on Bali, Pura Besakih, is located high on the slopes of Gunung Agung. Gunung Agung is an active volcano, with a large and deep crater that occasionally emits smoke and ash. The last major eruptions occurred in November 2017. Agung erupted in 1843, after having been dormant for a long time, this year the mountain began to be alive again. In the first days of the activity earthquake shocks were felt after which followed the emission of ash, sand and stones. The eruption of 1963 is one of the largest and most devastating eruptions in Indonesia's history. On February 18, 1963, local residents heard loud explosions and saw clouds rising from the crater of Mount Agung. On February 24, lava began flowing down the northern slope of the mountain, eventually traveling 7 km in the next 20 days. On March 17, the volcano erupted (VEI 5), sending debris 8 to 10 km into the air and generating massive pyroclastic flows. These flows devastated numerous villages, killing an estimated 1,100–1,500 people. Cold lahars caused by heavy rainfall after the eruption killed an additional 200. A second eruption on May 16 led to pyroclastic flows that killed another 200 inhabitants. Minor eruptions and flows followed and lasted almost a year. The lava flows missed, sometimes by mere yards, the Mother Temple of Besakih. The saving of the temple is regarded by Balinese as miraculous and a signal from the gods that they wished to demonstrate their power but not destroy the monument that the Balinese had erected. Andesite was the dominant lava type with some samples mafic enough to be classified as basaltic andesite. In September 2017, the area experienced 844 volcanic earthquakes, peaking at 300 to 400 earthquakes on 26 September. The frequency and intensity of these quakes caused much alarm among seismologists, as similar volcanoes have historically been known to erupt with even fewer warning signs. As a result of the increased rumbling and seismic activity around the volcano, the alert level was raised to the highest level and about 122,500 people were evacuated from their houses around the volcano. 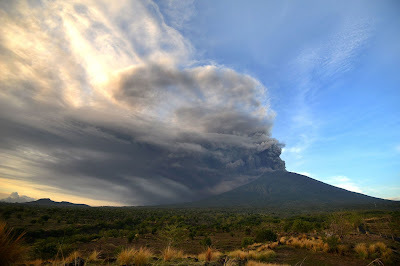 The Indonesian National Disaster Management Authority declared a 12-kilometer exclusion zone around the volcano on September 24. Evacuees gathered in sports halls and other community buildings around Klungkung, Karangasem, Buleleng, and other areas. The monitoring station is located in Tembuku, Rendang, Karangasem Regency, from which the intensity and frequency of tremors were closely monitored for signs of imminent eruption. By late October 2017, the activity of the volcano decreased significantly, leading to lowering of the highest status of emergency on October 29. On 21 November, activity increased once again. A phreatic eruption took place, with the ash cloud top reaching 3,842 metres (12,605 ft) above sea level. Thousands of people immediately fled the area, and over 29,000 temporary refugees were reported to be housed in over 270 locations nearby. A magmatic eruption began early on Saturday, 25 November. The resulting eruption plume was reported to rise about 1.5-4 km above the summit crater, drifting towards the south and dusting the surroundings with thin layer of dark ash, leading some airlines to cancel flights bound for Australia and New Zealand. An orange glow was later observed around the crater at night, suggesting that fresh magma had indeed reached the surface. On 23:37, 26 November 2017 (GMT), another eruption occurred, the second in less than a week. Ngurah Rai International Airport was closed 26 November, 2017, leaving many tourists stranded. Lahars were reported in the Selat district south of the volcano. More than 100,000 people in a 10 km (6 mi) radius of the volcano have been ordered to evacuate. Australia's Bureau of Meteorology reported on 27 November that ash from the eruption had been observed at an altitude of 9,144 m.